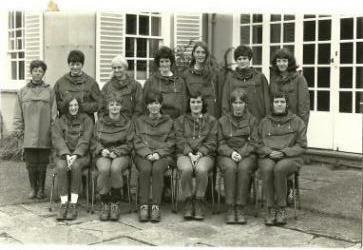 I attended Rhowniar for a month in May-June 1967 after being selected by my local authority by interview. I still have my diary from then as it brings back fond memories of the time spent there. In particular I remember doing our final 3 day expedition and the weather being exceptionally hot so we slept out under the stars; also scree running on Cader Idris. Looking back I find it hard to believe that we crammed so much in. The course boosted my self confidence as I had been frightened of heights, I overcame this fear which made me realise that most things are possible if you put your mind to it. Being away from home, relying on your own initiative and living with others stood me in good stead when I later went to college. Outward Bound nurtured in me a love for the outdoors in particular walking a passion which I still have to this day. The photo shows our dormitory Tryfan with our instructor Miss Standring.